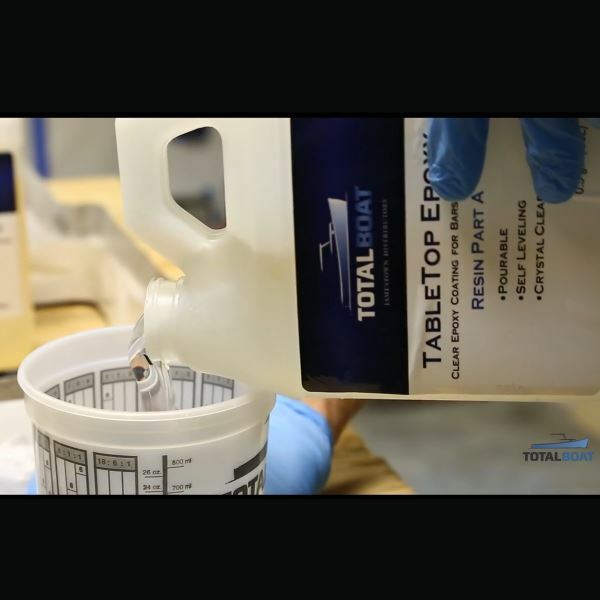 Pourable, self-leveling two-part epoxy system protects and preserves table tops, bar tops, and counters. It cures blush-free to a clear, glassy, 100% waterproof finish with excellent scratch, stain and yellowing resistance. 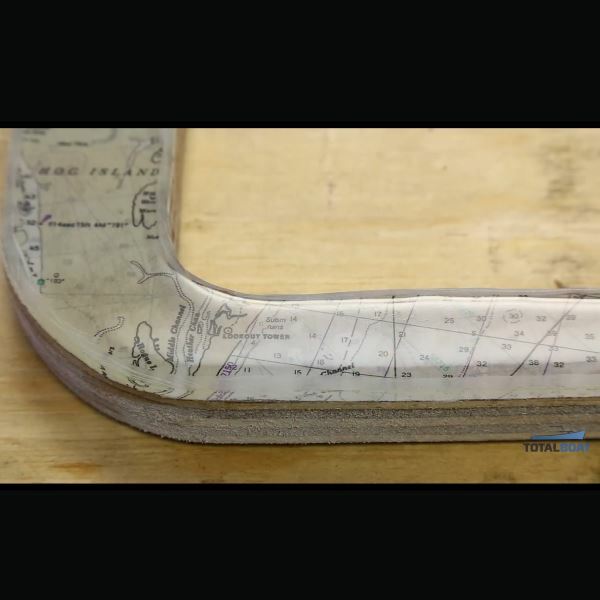 Here’s a very easy project that’s functional, durable, and looks great! You can use these simple steps to create your own beautiful, custom tabletop, bar top, or countertop, and you don’t need to be an expert to get great results! Click here for detailed instructions. Start with a dry, clean surface. To keep the mess to a minimum, catch any spills with a layer of plastic sheeting under your work area. Put plastic packing tape around the table edges to form a dam. Be sure your work surface is level before you pour. Put on your disposable gloves and pour 1 part resin and 1 part hardener into a clean, dry plastic mixing cup. To get ready for the next step, have a second clean mixing cup nearby. Stir slowly so you don’t get air bubbles. After 3-5 minutes, pour into a second cup and stir for another 2-3 minutes. Use a brush to apply a thin seal coat of epoxy. Delicate objects that may be damaged by epoxy (e.g., photographs) may need to be sealed in a clear coat before embedding. After the seal coat sets, pour the first flood coat up to 1/8″ thick. Use a plastic epoxy spreader to help spread the epoxy evenly. Wait 4-8 hours at 70°F between each flood coat. Remove surface bubbles by waving a hair dryer or heat gun quickly back and forth just above the surface. Recoat after 4-6 hours (up to 12 hours) directly on the previous layer. Let cure 24 hours before use or before removing tape around edges. 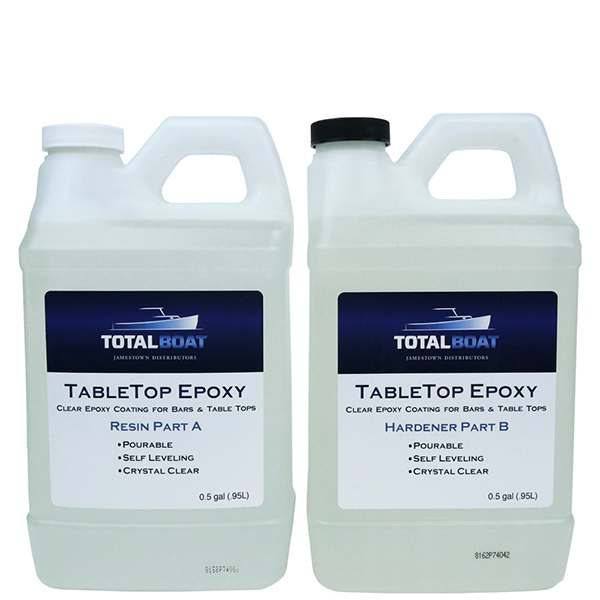 TotalBoat TableTop is a pourable, 2-part, clear coat epoxy system formulated for ease of use and superior results. It cures to a clear, deep, glassy and 100% waterproof finish that provides excellent scratch, stain and yellowing resistance. Upon full cure, TableTop provides unsurpassed finish clarity while preserving the surface underneath for a lifetime. TableTop makes it easy to cover a prepared level, horizontal surface containing just about any collection of personally priceless, glued-down objects (such as photographs, postcards, bottle caps, coins, charts, baseball cards, buttons) with multiple, thin layers of crystal clear protection. To make objects appear to float beneath the surface, embed them between coats. Just remember to seal delicate things (like photos) that the epoxy might damage, in an alternate clear coat before embedding them in the TableTop Epoxy. Or, skip the glued-down objects altogether and just coat the flat surface as is. Wait 4-8 hours between coats to get the maximum self-leveling benefit and a crystal clear finish. Almost any horizontal, level surface is fair game. Chart tables, galley tables, cockpit tables, and coasters are just a few of the creative possibilities. Application temperature: Apply only in temperatures between 70-80°F. Warm conditions are critical for success. Edge taping: Before mixing the epoxy, contain the liquid epoxy by taping the edges of the top. 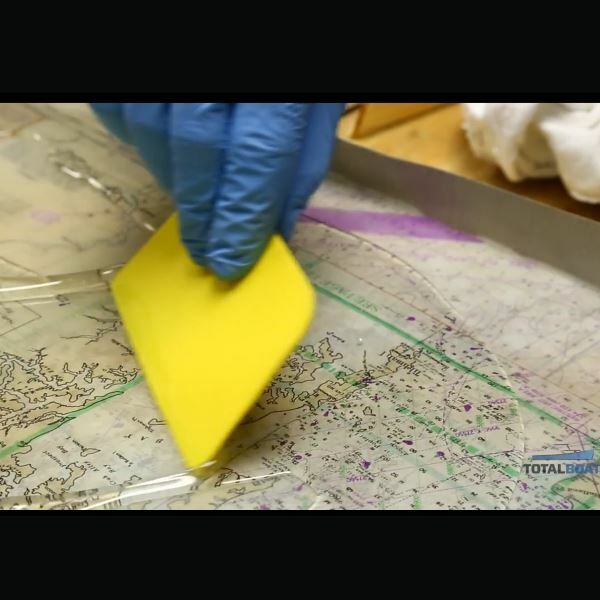 Packing tape is best because it releases cleanly and easily after the epoxy cures. Flood coat application(s): Pour on and spread with an epoxy spreader. Flood coats should be no thicker than 1/8″ each. Coverage at 1/8″ thick (2-Quart Kit): 6.4 sq. ft.
Coverage at 1/8″ thick (Gallon Kit): 12.8 sq. ft.
Coverage at 1/8″ thick (2-Gallon Kit): 25.6 sq. ft.
UV-resistant formula is not intended for outdoor applications with prolonged exposure to sunlight. Do not place items hotter than 125°F on the cured surface, or it will become distorted and discolor.